News | THE UNDERWATER WELDER swims up the Amazon... Dot Com Top 10! Mega-retailer Amazon has just released their 2012 Best Books of the Year list, and we spy a few familiar names on the Top 10 chart for Comics & Graphic Novels! 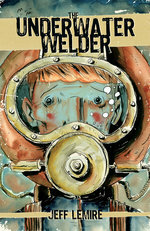 Jeff Lemire's devastating story of fatherhood and fear, The Underwater Welder, adds another feather in its cap with its appearance on the list, confirming this recent prediction in the New York Journal of Books: "This is a title almost guaranteed a place on the shortlist of the best graphic novels of 2012... Lemire is at the top of his game here." Under the Radar agrees: "Like all of Lemire's work, the story packs an emotional gut punch that hits you when you're not expecting it. It's sure to stand as one of the year's best books in any medium." 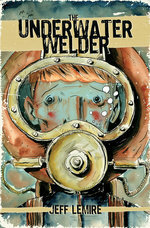 If you're just now discovering The Underwater Welder, you're in luck: it's just arrived in a new printing, plus it's available in digital form via six different retailers, as well as the Top Shelf app! We're also pleased to see Jeffrey Brown's sweet and funny book Darth Vader and Son make the list! The phenomenal success of that book, plus the release of his Sundance-hit movie Save the Date, make this quite a year for Mr. Brown. Following his lighthearted Star-Wars-themed take on fatherhood, published by Chronicle Books, Jeffrey will return to Top Shelf next year for the sober, literary flip-side: A Matter of Life. Stay tuned for more details!